1. Very great mental or physical pain: Ralph's sister was in terrible agony after slipping on the icy sidewalk and breaking her leg. 2. Death pangs: Lorna said her husband died in agony at the hospital. 3. A convulsive struggle: The doctor told Harriet that the medicine would relieve her of the agony of the muscle cramps. 4. A sudden, strong outburst of emotion: There was an agony of joy when the school's football team won the championship. It is strange that a word which currently refers to anguish and intolerable pain should have its origin in a festive sport event; yet, that is the case with agony. 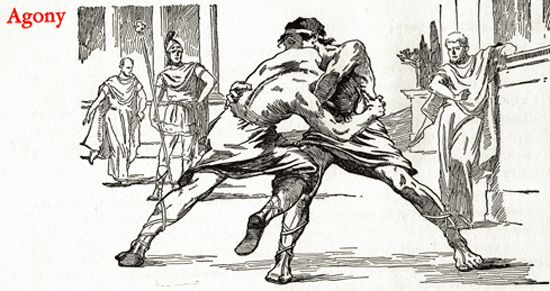 In ancient Greece, agon was a public assembly; especially, one for public games and athletic contests. Agonia was the contest or struggle for a prize. From the meaning "a struggle for victory in the games", agonia gradually expanded to mean any physical struggle, an activity fraught with difficulty or pain, and then mental anguish as well. Our own English word agony, borrowed from this source, meant struggle or anguish of mind, then the throes (violent pangs of suffering) of death, and then any extreme suffering of body or mind. Springfield, Massachusetts; 1933; page 11.